Beautiful white gold setting with alternating sapphire and diamond sidestones. 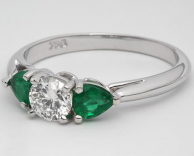 We love the addition of the green, pear-shaped emerald sidestones in this ring -- really livens it up with some color! Add a round diamond of your choice to sit in the center and you'll have a really great ring. Add some passion to your engagement ring with two red, ruby sidestones alongside the diamond that you choose to set in the center of this unique 18k white gold engagement ring. This setting is designed for a princess cut diamond, but can also be set with a round, emerald, or radiant cut diamond.